Twenty - Nine participants from Six different states viz, Andhra & Telangana (17) Delhi (3), Maharashtra (3), MP (1), Panjab (2), Rajasthan (1) Uttarakhanda (2) reported on 11th and same day the participants attended the Introductory session, wherein the participants were given the guidlines of the Shivir. On 12th morning, Shivir was started with inaugural lecture on “Concept of Yoga” by Mananeeya M.Hanumanthraoji, the all India Treurer of Vivekananda Kendra.The 29 participants were organized into three different Ganas (groups) –, Chandra Bhaga, Vitasta, Bhrungi – Name of the rivers of Kashmir. The impressive largely attended meet of devotees particularly hundreds of Community Youth working in Valley from Sheikhpora Budgam, Srinagar, Pulwama ,Monghama, Tumlahal, Drassu, Muran, Tahab , Ladeb, Koil, Hall, Shopian , Kulgam, Devsar, Aidgen, Vessu, Dialagam, Mattan, Saller , Wulrama, Akura, Laisar, Mahand , Khirhama, Charigam, Logripora, Lajura, Seer, Hutmurah , Anantnag , Uttrsoo,Nowgam, Pinglana ,Chandrigam, Bomzoi, Choudharigund and other areas was warmly addressed by Mr. B.L.Bhat Chairman Administrative Committee, “SRMA”, Nagdandi. Vivekananda Kendra is propagating the message of Swami Vivekananda and Indian Culture since 1977 through its Yoga Shibirs in Vivekananda Kendra Nagdandi (Sri Ramakrishna Mahasamelan)- Kashmir. During Militancy period in Kashmir it discontinued (1990-2011).and Since last 3 years it was again started. 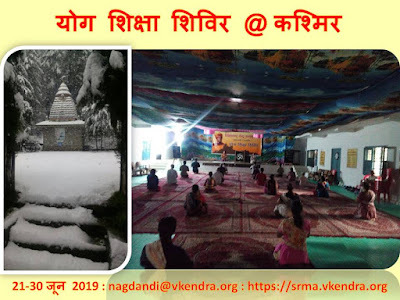 This year Yoga Shiksha Shibir (Hindi) of 10 days duration of All India Level from 21-30 May 2014 was organized in Vivekananda Kendra Nagdandi (Sri Ramakrishna Mahasamelan)- Kashmir. Total 13 participants (4 sisters & 9 Brothers) from Andhra Pradesh, Himachal, J&K, Odisha, Harayana, Uttar Pradesh participated very enthusiastically. They followed the Yoga Way of Life as taught by Swami Vivekananda. The Participants ware distributed in Two groups, name of rivers : Vitasha (Jelam) and Chandrabhaga(Chinab).